Physical characteristics: Southern cassowaries are 50 to 67 inches (127 to 170 centimeters) in length. Females weigh about 128 pounds (58 kilograms) and males weigh 64 to 75 pounds (29 to 34 kilograms). The neck skin is red and blue and the feathers of adults are glossy black. They have two long, red wattles, which are folds of un-feathered skin that hang from the neck. Geographic range: Southern cassowaries are found in Queensland in two areas of northern Australia: the wet tropics from Mt. Halifax to Cooktown, and on Cape York Peninsula. They also live in Papua New Guinea. Habitat: They live primarily in lowland rainforests below 3,600 feet (1,100 meters). Diet: Southern cassowaries are omnivores, meaning they eat both plants and flesh. Their diet consists mainly of fruit but they will also eat flowers, lizards, snakes, snails, small marsupials, and birds. Behavior and reproduction: During the breeding season in June and July, the female lays one to four lime green eggs in a nest that is incubated by the male. The female then moves on to lay eggs in several other males' nests. Incubation lasts from forty-seven to sixty-one days. The male cares for the chicks for nine months after they hatch. Southern cassowary and people: Once common throughout its natural range, the southern cassowary is now rarely seen in the wild. In Australia and Papua New Guinea, the southern cassowary is part of the mythology and culture of the indigenous peoples. The birds are still hunted and chicks are captured and raised in pens until they become adults, then slaughtered for meat. 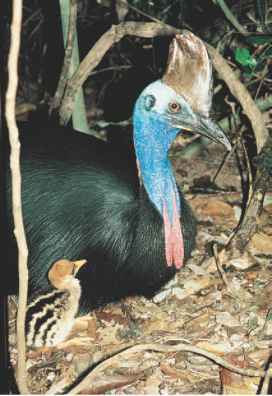 The southern cassowary needs large areas of rainforest to survive and protected areas, such as national parks, are not enough. Conservationists in the two southern cassowary population areas have been using different methods to combat this problem. They have established nurseries to grow rainforest fruit trees that can be replanted in cleared land, as well as forming corridors between two separated habitats. Clements, James F. Birds of the World: A Checklist. Vista, CA: Ibis Publishing Co., 2000. Davies, S. J. J. F., et al. Ratites and Tinamous: Tinamidae, Rheidae, Dro-maiidae, Casuariidae, Apterygidae, Struthionidae (Bird Families of the World, Volume 8). Oxford, U.K.: Oxford University Press, 2002. Baker, Jordan. "Qld: Cassowary Numbers Falling." Asia Africa Intelligence Wire (September 13, 2002). "Be Wary, Cassowary." U.S. Kids (March 1998): 19-22. Bond, Ruskin. "The Elephant and the Cassowary." Highlights for Children (February 1997): 25. "Cassowary Talks to Mates in a Low Tone." Asia Africa Intelligence Wire (November 6, 2003). Mack, Andrew L., and Gretchen Druliner. "A Non-Intrusive Method for Measuring Movement and Seed Dispersal in Cassowaries." Journal of Field Ornithology (April 2003): 193-196. Mack, Andrew L., and Josh Jones. "Low-Frequency Vocalizations by Cassowaries." The Auk (October 2003): 1062-1068. Nihill, Michael. "Dangerous Visions: The Cassowary as Good to Think and Good to Remember Among the Anganen." Ocean (June 2002): 258-275.